Queen’s British Steakhouse and Grill, in the former British Queen pub on New Wanstead, was due to open on Saturday. Expectations are high – so as is our tradition at Wansteadium, reviews are welcome. Please add comments below or e-mail at wansteadium[at]gmail.com. PS. 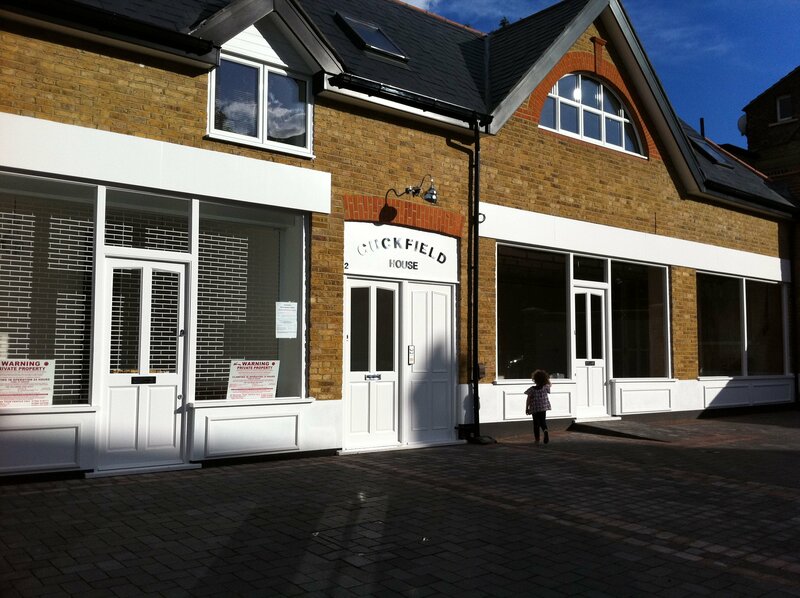 It looks like the first tenant is about to move in to the renovated Cuckfield Garage – a thoroughly smartened piece of Wanstead which has preserved some of the feeling of the original. But there will be disappointment for those hoping for an increase the diversity of Wanstead shops – first in will be a beautician. Arriving a little under dressed and definitely punk completely failed to phaze our head waiter. He seated us under a reproduction of the ‘God Save The Queen’ album cover, thus turning us into a feature of the very British theme. The food can’t be recommended highly enough. Meat all sourced from the same farm in Yorkshire and brought to the table on a platter (with waiter’s patter) for your selection. Returning cooked just right, cutting like butter and certainly the best tasting I’ve had in recent memory. Buying British isn’t taken to silly extreems though, the wine list is international and covers all tastes. The American Brat Pack background music didn’t work for me personally but that’s subjective and crooners are, at least, inoffensive. My own real disappointment was that the coffee did not meet the standard of the rest of the meal. Slightly incipid coffee can be forgiven when the staff are as charming and the food such good value. The experience overall is well worth repeating. proper steakhouse, serving high quality meat with good sides. Yet to try SUnday lunch but booked for Sunday so will let you know!! Very nice relaxed atmosphere with friendly and efficient waiting staff and food cooked exactly as ordered. No complaints at all, hard to find a fault. If you fancy meat then this is the restaurant to book. We popped in on Wednesday – very good food. Just seems as if it isn’t promoted enough. I went last saturday with 5 friends and found the service 1st class. I am afraid to say the seating arrangements were not good.W e had the next table to us knocking us ,without a sorry as we were eating ,also,plates were being passed over us,this spoilt the night. We ordered side orders.The salad was more like a coleslaw,than a salad.The veg only had cabbage and nothing else. The bill was rather expensive,it came to Â£280.We only had 1 bottle of wine, 2 bottles of water and 3 lagers. Decided to try this venue out on Sunday. Initial impressions were good, a friendly welcome however once seated no one came near us for at least 10 minutes. I had to waive my arm about to get someone’s attention in order for us to place an order for drinks. I also noted that out of the 4 small wine menu’s on the table 3 of them were sticky! Prawn and Crab cocktail served in a Martini glass was ok, although would recommend smaller stemmed cocktail glasses. We all enjoyed the Sunday roast, desserts were mediocre. I think this could be a little gem of a place but they need to improve service and make sure that menus are clean.